It’s been a tumultuous year for my family, my father in particular. Last November, a routine doctor’s appointment turned up what turned out to be a major health crisis. Nearly one year – and two major heart and vascular surgeries later – my dad is getting ready to celebrate his 61st birthday. The past year has given my dad – and my entire family, really – a chance to reflect on what’s important in life. It’s also brought my father’s health, finances, and goals for the final decades of his life into play. God willing, my father will turn 62 next year, and reach the minimum age for drawing on his Social Security benefits. But will he? It’s a question my parents are struggling with right now; and, for this reason, it’s a topic my husband and I have been discussions more and more often. That’s Social Security in a nutshell. However, the program should only be a piece of your retirement plans, not the whole thing. That’s why so many soon-to-be retirees – like my dad – find themselves debating when to start drawing on their payments. 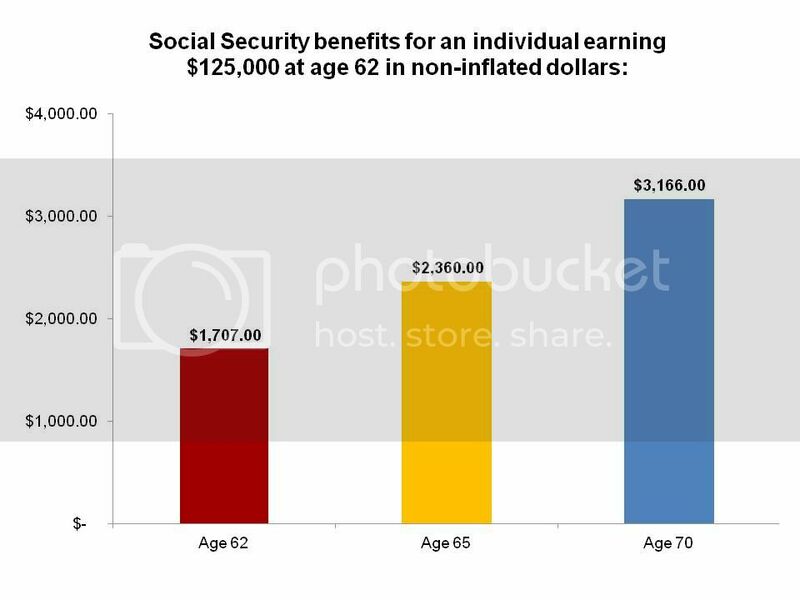 As I mentioned above, the earliest you can draw from Social Security is 62. This minimum age is set by the government, and is subject to change, particularly as life expectancy increases and retirees and their families draw on Social Security for longer and longer periods of time. The normal age when you can draw on your benefits is 65; anything beyond that is called delayed benefits, however, there is no financial advantage to postponing your benefits beyond age 70. This information, which comes from the August issue of MONEY Magazine, mirrors very closely to my father’s annual income at age 61, which is why I chose to use it. As you can see, if my dad started collecting his Social Security benefits next year – at age 62 – he’d draw a monthly benefit of just over $1,700. Not too shabby. But if he could hold off three years, he’d draw an extra $653 a month – an increase of nearly 39%. Waiting until he reached age 70 – remember, there’s no boost to those monthly checks by delaying benefits beyond that point – would bump him up to $3,166 a month; that’s a boost of nearly 85% compared to the benefits at age 62. If my dad was in especially good health, this would be an easy decision – he’d wait til age 70 to start collecting benefits. However, with two major surgeries under his belt in just the past year, he’s feeling rather fatalistic these days and actually considering drawing on his benefits early: maybe not next year, but potentially by age 65. During that time, he’ll allow his other retirement plans – his pension at his work (yes, he still has one, lucky SOB), his 401(k), and his other investments – to continue to grow untouched. He’ll still work, provided he’s healthy enough (he’s currently building back up to a 40-hour work week following his most-recent surgery this past May), so he’ll be drawing a double-income. He’s even considering investing those Social Security payments, and allowing them to grow on his terms, not the government’s. Reader, have you given much thought to your Social Security? Do you even think the program will still be around when it’s time for you to retire? This is a subject I have been thinking about a lot lately. My husband is 59, and works at a high-stress job that he hates with slim-to-none chance of finding a different one. He seems to have aged a lot in the past few years. If there is any way at all that he can retire at 62 I would like him to do it. The age for full social security benefits is going up; he would have to wait until he is 66 to get the standard benefits. I would rather he have four more years that he can enjoy his life, and reduce our standard of living. Some things are more important than money.